So, we're in the new house! The move was epic. Literally 8 hours. We have a lot of stuff and there were a couple of glitches, but phew, most everything is here (with the exception of food since the fridge isn't working). Here's the rainy view from the upstairs office. 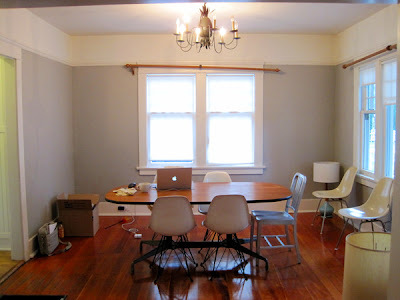 I'll be working from the dining room until I find a desk I want to use up there. 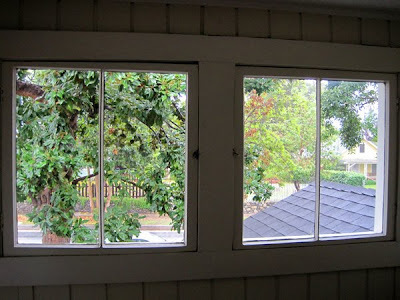 I just love this view of the magnolia tree outside, it feels like you're in a tree house. Here's where I am, sitting at the Herman Miller Dining Table I'm borrowing from my dad (if you can believe it, he has no use for it at the moment). We still need to swap out the lamp above the table and there's a credenza that will probably go underneath those windows, then lamps, curtains, etc. The grey worked out in the end (though, it's just a teeny bit purpley in certain light. But anyway, it's good enough (I'm learning to not let perfect be the enemy of the good). For those that track these things the color is Ben Moore Stone Harbor. Oh and please don't mind that hanging curtain rod. I guess the last tenants accidentally took the braces? And since we're all friends here, I will share a picture of the kitchen as of this morning. It actually looked better the day we moved in, but since then we figured out that the fridge doesn't work and that kind of...threw everything off. Look at how confused Hazel looks. We have a lot of work ahead of us, but I'm going to take it easy today, it's been exhausting! omg! our big day is only 2 weeks away!! glad to see ya'll made it safe and sound--and you're right, that kitchen is smokin;! keep up the inspiration Laure! Good job with the move and the painting! Your kitten is so cute! 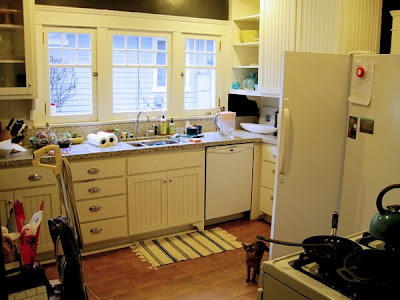 I am still totally in love with your kitchen! congratulations on surviving the move! i think the grey looks great. and i'm jealous of your eames table. Moving can be quite an ordeal but I also love the idea of starting fresh. Love the look of your dining room already. And, well...the view from upstairs looks quite lovely! Love your view of the magnolia tree. Will be fun to work up there in the office! it looks amazing! can't wait to see it all come together! Wonderful place you have there! (b) what is the width and lenght? so glad your in, enjoy your new home, I remember when I moved into our house I had EVERYTHING to do. wow... it was fun but boy what a job. Now I am changing my living room into a shabby chic look which involves sanding, painting, purchasing (that I like), soon though it will be done. Stop over when you get time and take a peek.